King Tutankhamen's Farewell Tour After 5 1/2 years, eight cities and nearly 8 million visitors, Tutankhamen's grand touring exhibit is headed home. A new museum in Giza has been specially designed to house the gilded treasures of the king. Replicated Remains: The actual remains of King Tutankhamen have never left Egypt's Valley of the Kings. Instead, the touring exhibit features a life-size, 3-D replica (above) constructed using CT scans of the real mummy. For only few more days, some of Egypt's most prized and promoted possessions can be found in the heart of Midtown Manhattan, tucked between a Broadway musical production of Spider-Man and the Times Square Ripley's Believe It or Not museum. 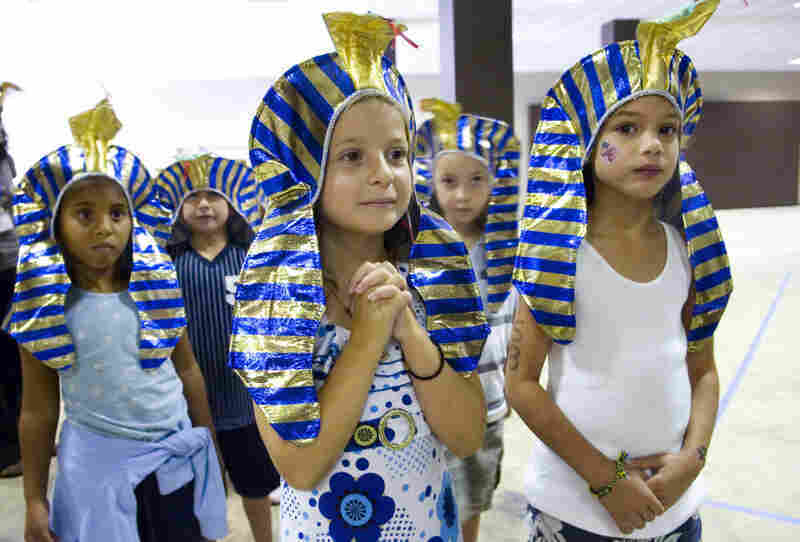 Schoolchildren from Morningside Elementary prepare to see the King Tutankhamen exhibit, which visited the Atlanta Civic Center in November 2008. The ancient Egyptians believed if your name lived on after you died, then you would enjoy eternal life. 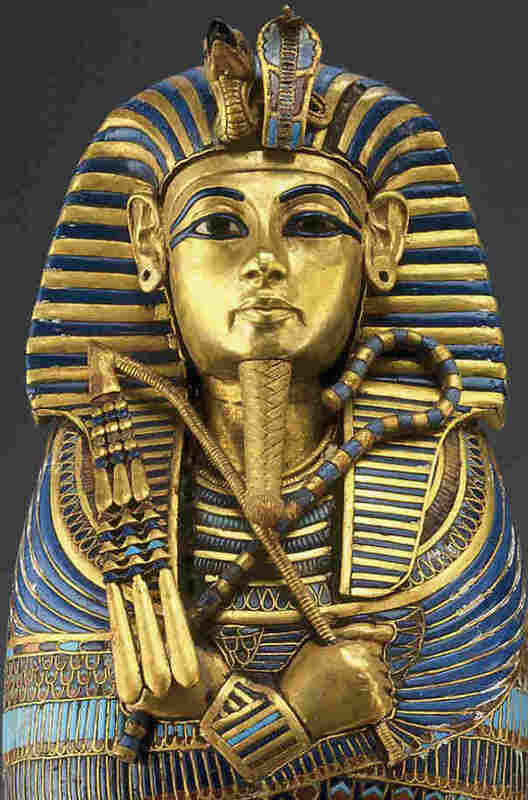 If they're right, King Tutankhamen is pretty spry for a guy who is more than 3,000 years old. 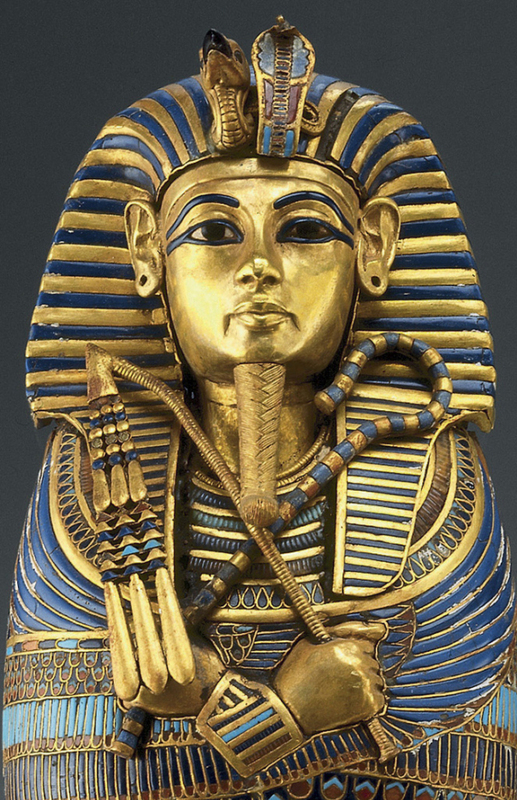 It is "King Tut" the phenomenon that has inspired fashion designers and satirists alike for more than a generation. After 5 1/2 years, eight cities and nearly 8 million visitors, Tutankhamen's grand touring exhibit is headed home to a new museum in Giza specially designed to house the gilded treasures of the king. "I wanted to come see the real thing," said New Yorker Michael Gold, as he wandered around the exhibit. "Thank goodness I came to see it before it disappeared. I couldn't wait another 40 years." The last time Tutankhamen graced these shores back in the 1970s, he became a phenomenon, triggering so-called Tut-mania -- remember Steve Martin's homage to the boy king? 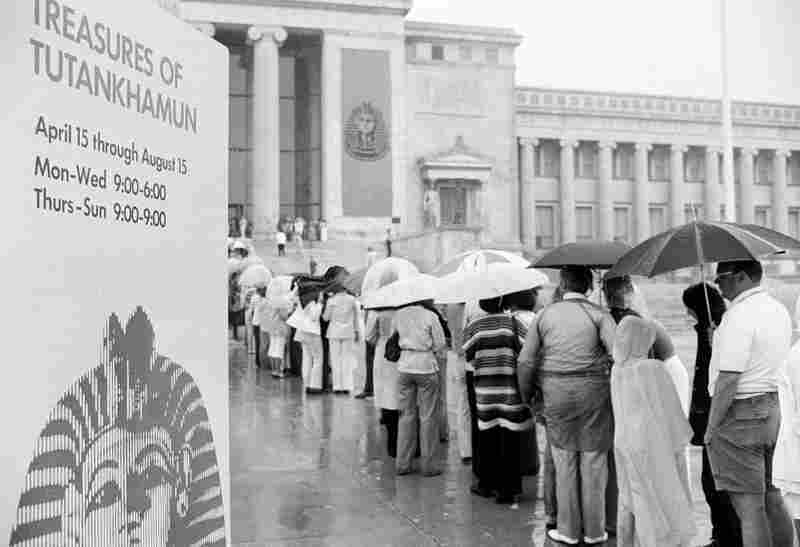 Tutankhamen's treasures last visited the U.S. in the 1970s -- viewing the exhibit was billed as a once-in-a-lifetime opportunity. Above, people stand in line at Chicago's Field Museum in June 1977. Organizers say this is likely to be the last time Tutankhamen and his relics tour the U.S. To be precise, Tutankhamen never made the tour: Instead of his actual mummy, the exhibit features a life-size 3-D replica based on CT scans of the real mummy. Tutankhamen's remains have never left Egypt's Valley of the Kings. Back in the 1970s, viewing Tutankhamen was described as a once-in-a-lifetime opportunity. It cost just a few dollars for admission. Three-plus decades later, the exhibit became a twice-in-a-lifetime opportunity that cost $29.50 plus taxes for each ticket. Organizers suspect Tutankhamen's touring days are over; the Grand Egyptian Museum will be the final resting place for the boy king's treasures. "When the exhibition toured in the '70s, Egypt saw very little money from that very successful exhibition," says Mark Lach, senior vice president for Arts and Exhibitions International, the organization that collaborated with the Egyptian government to bring Tutankhamen back to the U.S. This time, Egypt gets the majority of the cut. "I think bringing the exhibit to the United States to raise funds for Egypt was a very important part of the reasoning for bringing the exhibit back to the U.S.," Lach says. Tutankhamen and his golden entourage will return to Egypt with about $80 million. The money will be spread around -- some will aid the preservation of Egyptian temples and monuments, but the bulk of it will pay for the construction of The Grand Egyptian Museum, the final resting place for the boy king's treasures. Tutankhamen's traveling days are over, or at least David Silverman thinks so. He's curator of the current Tutankhamen exhibit and was the curator of the 1977 tour stop at Chicago's Field Museum. "I think the whole buildup has been to bring it back to Egypt and I think once that happens there's a very good chance that it's not going to travel again," Silverman says. There's one more stop on the king's comeback tour, in Melbourne, as the relics await completion of the Museum in Giza.